White or white with orange, amber or chestnut markings. The AKC Foundation Stock Service (FSS) is an optional recording service for purebred dogs that are not yet eligible for AKC registration. The Bracco Italiano [ˈbrakko itaˈljaːno] is a breed of dog developed in Italy as a versatile gun dog. The Bracco Italiano - or Italian Pointer- should be athletic and powerful in appearance, most resembling a cross between a German Shorthaired Pointer and a Bloodhound, although it is nothing like them in character. It has pendulous upper lips and long ears that create a serious expression. It should be "almost square", meaning that its height at the withers should be almost the same as the length of its body. It should not however be actually square as this would render its famous rear driving push off and front/rear extension to be compromised, thus losing much of its powerful grace. The tail has historically been docked, mostly due to the strong possibility of injury in rough/dense terrain when hunting, however there has been a sea-change in the European Union, with some now working the breed with full tail. Coat colors in Bracco Italiano puppies. The Bracco Italiano has a distinctive solemn facial expression. The coat is short, dense, and glossy. The texture should be fairly hard, though somewhat shorter and softer on the head, throat, ears, legs, and feet. Shedding happens a couple of times a year, and a hound glove really helps in removing dead coat. The most common colours are Bianco-Arancio - White-Orange and Roano-Marrone - Roano-Brown, chestnut, or amber coloured patches on the face, ears, base of tail, and body. Black on the coat is a fault, as are "three-color" dogs, such as orange/white with chestnut spottings above the eyes, on the muzzle and legs, such as the pattern of a Doberman or Rottweiler. weight is 25–40 kilograms (55–88 lb). The gait, when hunting, starts out as a gallop, but slows to a long trot as the dog comes into scent. This trot should be long and fluid, with plenty of reach and drive (the 'almost square' body contributes to this). As a Bracco comes closer and closer to scent, the gait slows to a creep, and settles into a "point", with a front leg usually held up in the classic pointing dog position. The point may be held (no movement) or the dog can "creep" along with the bird's movement - especially convenient with birds that run, like the pheasant. Either is acceptable in Italy. The head should be held above the topline, which facilitates the air scenting for which this breed is known. A well-built Bracco, with a full and developed musculature covering, is an attractive mover and covers a lot of ground. Braccos are very much a people-loving dog and thrive on human companionship, having a strong need to be close to their people. They are a particularly good family dog, and many have a strong love of children. They get along well with other dogs and pets, if trained to do so - it is, afterall, a hunting breed - and must be taught what to chase and what not to. They are very willing to please as long as they have decided that your idea is better than theirs. Obedience training is a must for a Bracco, and the more is asked of them, the better they do. Harsh reprimands do not work with this breed unless the reprimand is a fair one - and harshness must occasionally be used with some dogs to remind them who is actually in charge. Although not an aggressive breed, many Braccos will alert if there is a reason, and some will bark or growl if there's a good reason. The breed loves to hunt, and they excel at it - in fact, a non-hunting Bracco is not a happy Bracco, and will act out in various other ways. Hunting without a gun is an area in which the Bracco can excel and this can be a great opportunity for training the dog to connect with the owner. They are an active breed, but require more mental exercise than physical exercise to keep them happy. A Bracco owner can teach games like hide-and-seek (an object or person) which fits into the breed's original and current usage, and keeps them mentally active. The Bracco Italiano originated in Italy, and there are writings[which?] concerning the breed that date back to the 4th and 5th centuries BC. It is believed[by whom?] to be a cross between a Segugio Italiano (a coursing hound) and the Asiatic Mastiff. Others[who?] claim the breed goes back to the St. Hubert Hound. Undoubtedly, both hounds and gundogs are in the breed's ancestry for there was an old practice of mating these together to produce a dog capable of pointing, but with more stamina. There are two variations of the breed. The first originated in Piedmont, and was for that reason known as the Piedmontese Pointer. 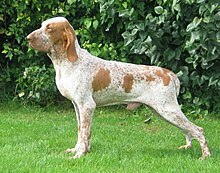 The other originated in Lombardy, and was known as the Lombard Pointer. The Bracco from Piedmont is lighter in color and build than the Lombard variety, probably due to the mountainous terrain there. It was well established by the Middle Ages. The Bracco thrived during the Renaissance and was bred by both the Medici and Gonzaga families. They were sought out by the aristocracy and used to hunt feathered game. At the end of the 19th century and the early 20th century the breed nearly became extinct. Later, it was saved primarily by the combined efforts of the Italian breeder Ferdinando Delor de Ferrabouc and - during the later World Wars - of a few staunch Italian breeders[who?] whose families had already dedicated themselves to the Bracco over several centuries. The Italian standard for the breed was released in 1949 from the S.A.B.I. (Societá Amatori Bracco Italiano) in Lodi, Lombardy. It came to England in 1989. ^ Cunliffe, Juliette (23 October 2012). "Bracco Italiano: Special Rare-Breed Edition : A Comprehensive Owner's Guide". i5 Publishing. Retrieved 20 August 2018 – via Google Books. Wikimedia Commons has media related to Bracco Italiano. This page was last edited on 3 February 2019, at 12:19 (UTC).